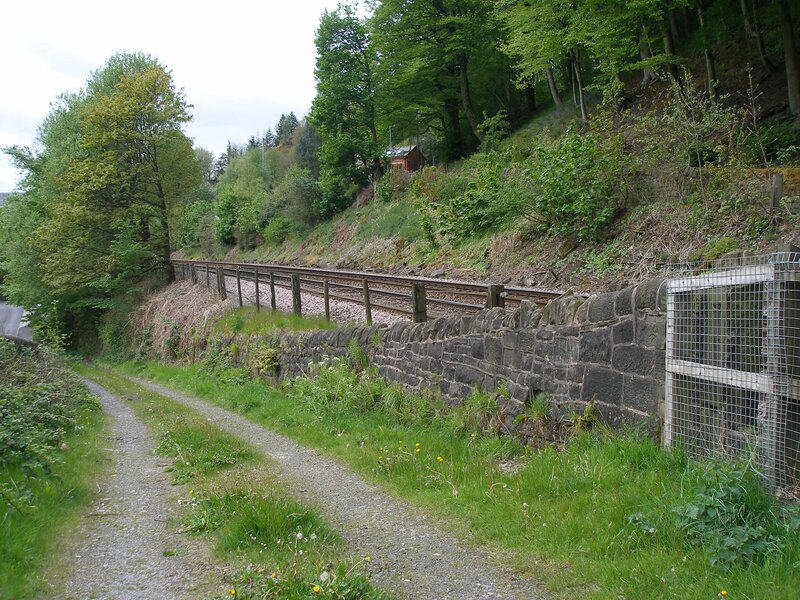 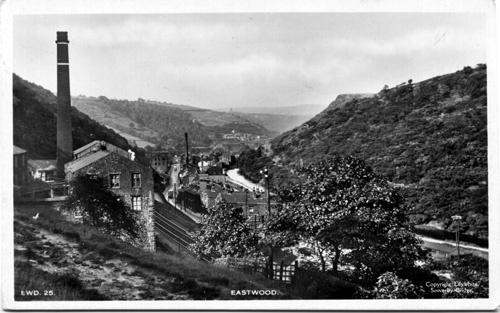 Eastwood Station had a particularly cramped site, with the goods yard on the down (hill) side of the line, whilst the coal drops were reached via a diamond crossing in the Up line to place them alongside the road on the valley side of the line. This is a photo survey conducted on Sunday 17 May 2015. 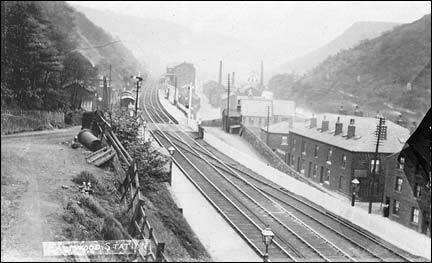 To see how the area looked in past times check out the Hebden Bridge History site; this has a very well illustrated narrative. 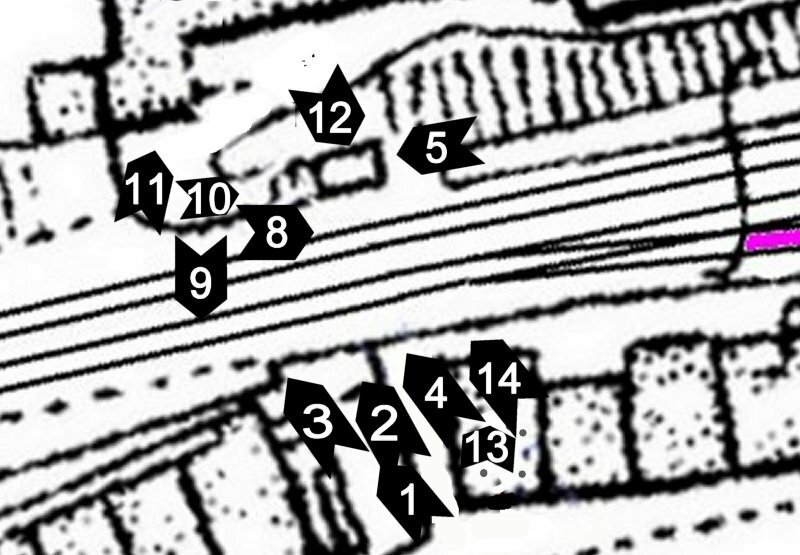 The first area surveyed is shown in the extract from the 1907 Ordnance Survey map below, and covers the three 'arches' at the top (Up) end of the site. 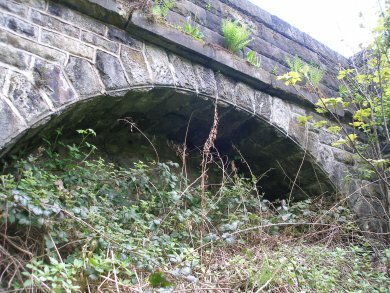 The site has three arches at its western end; the first arch from the Manchester end of the site is illustrated below. 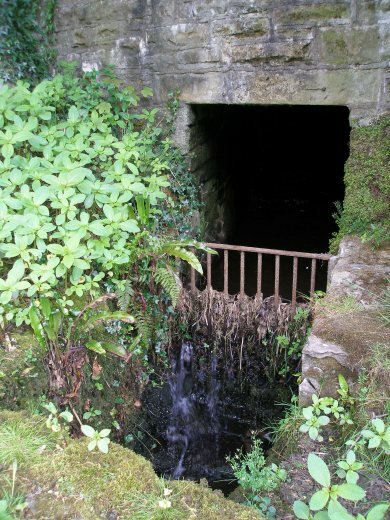 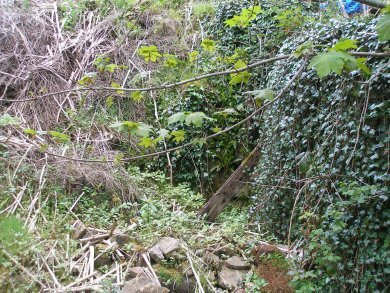 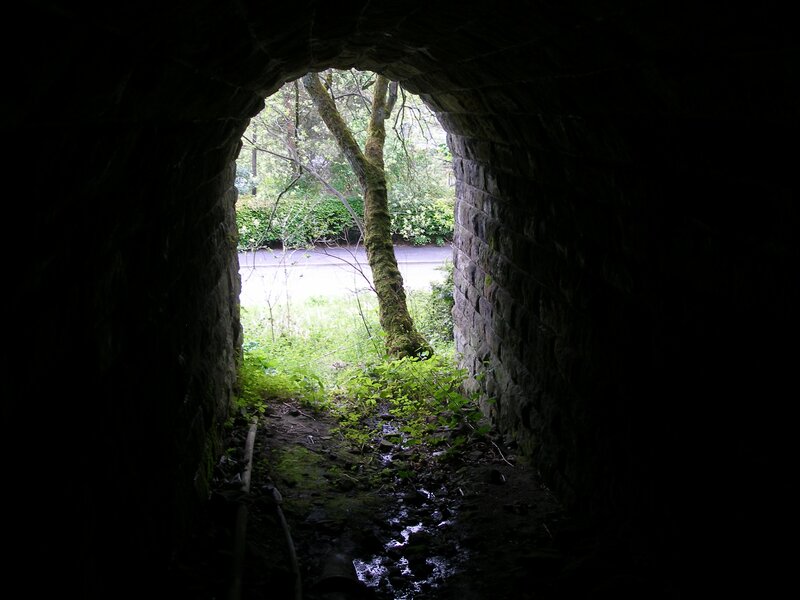 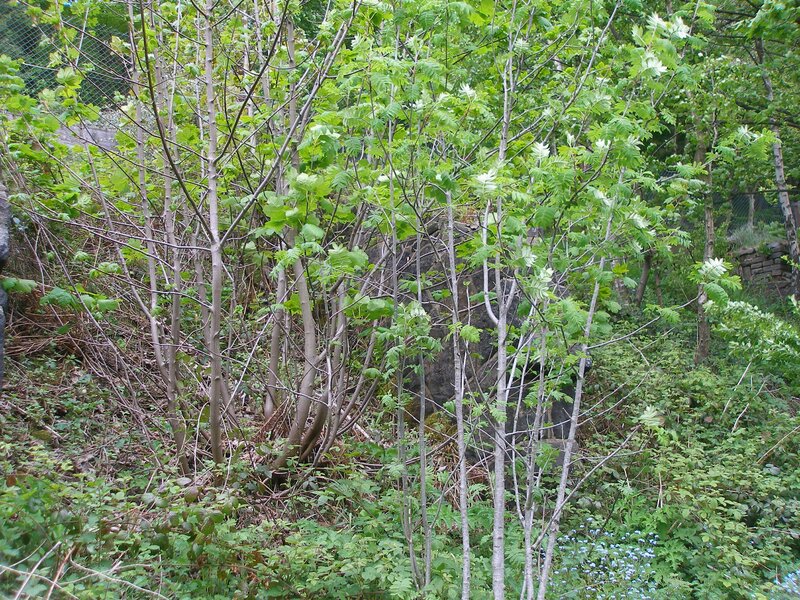 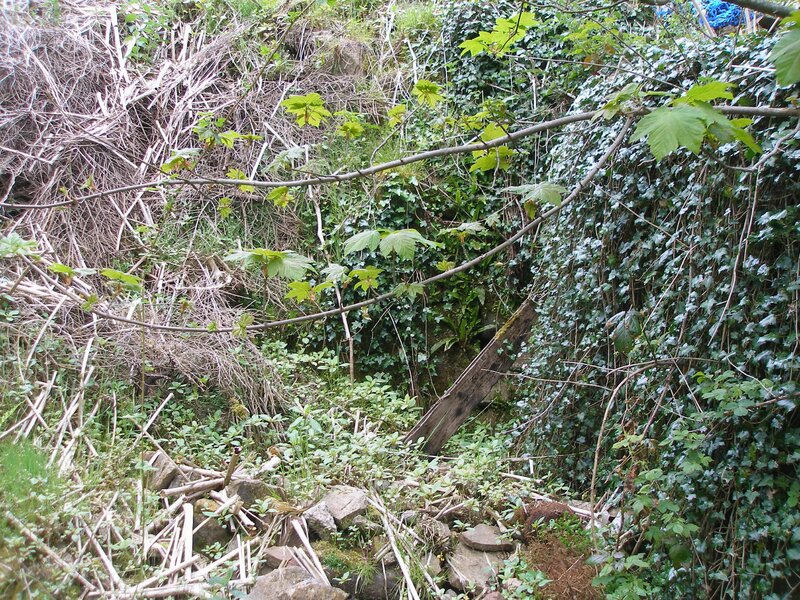 The stream emerging from it appears to rise under the railway, and disappears into a culvert towards the road. 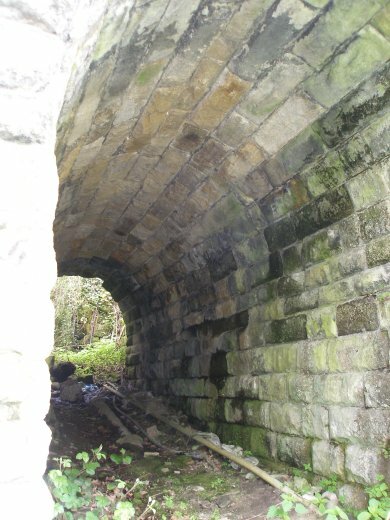 Click here to see how this arch fitted into the original 'townscape'. 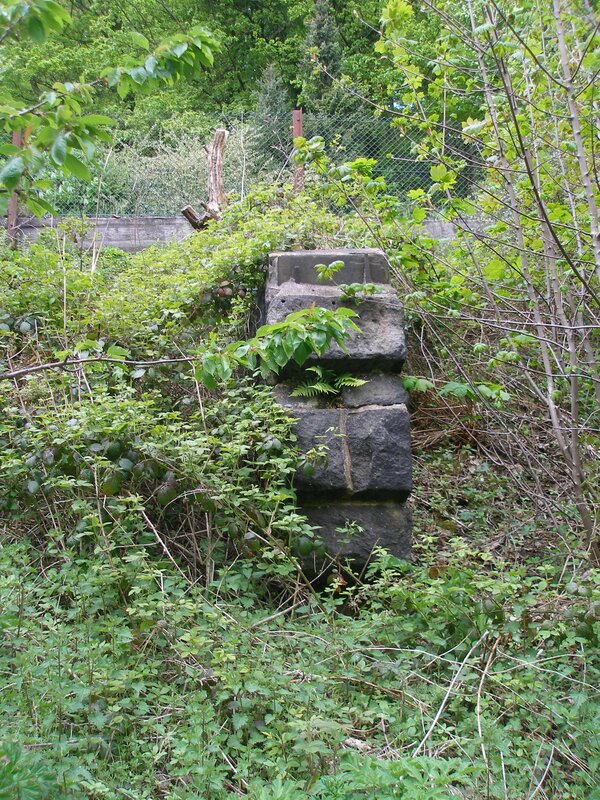 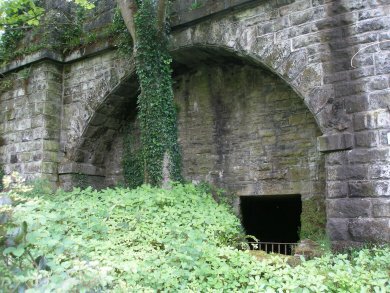 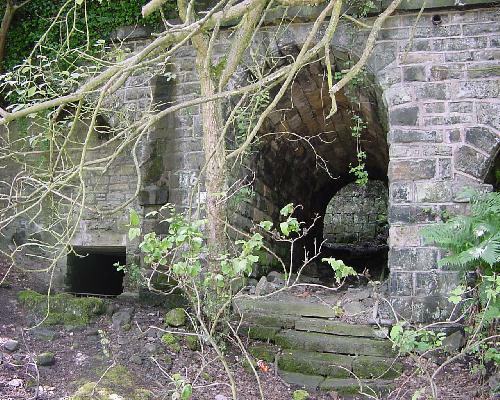 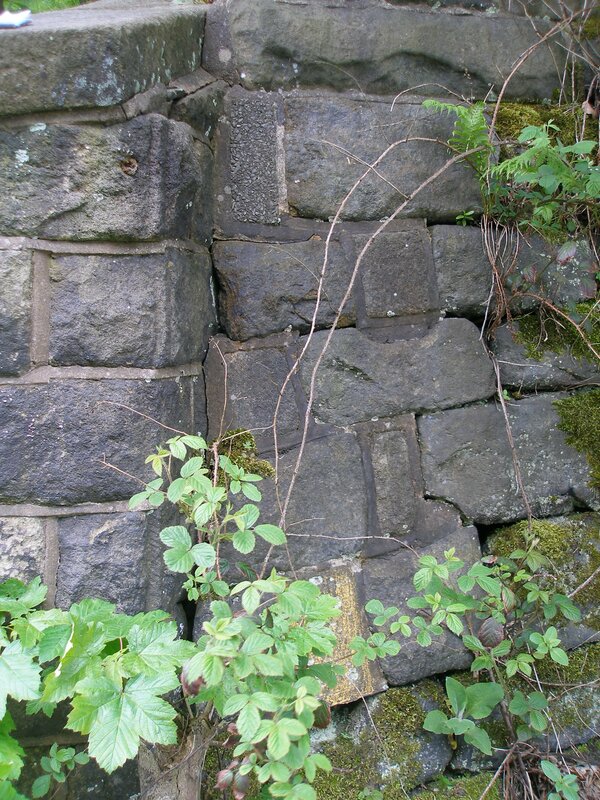 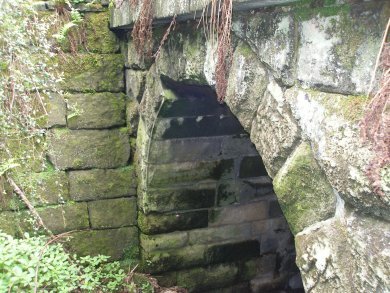 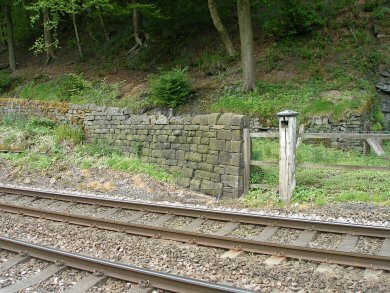 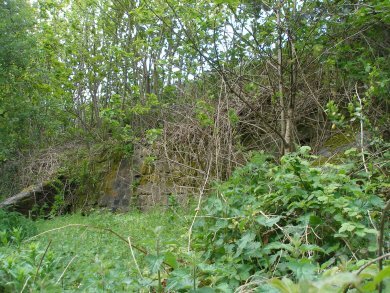 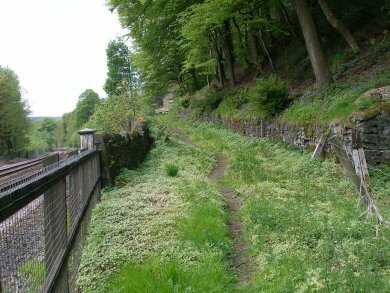 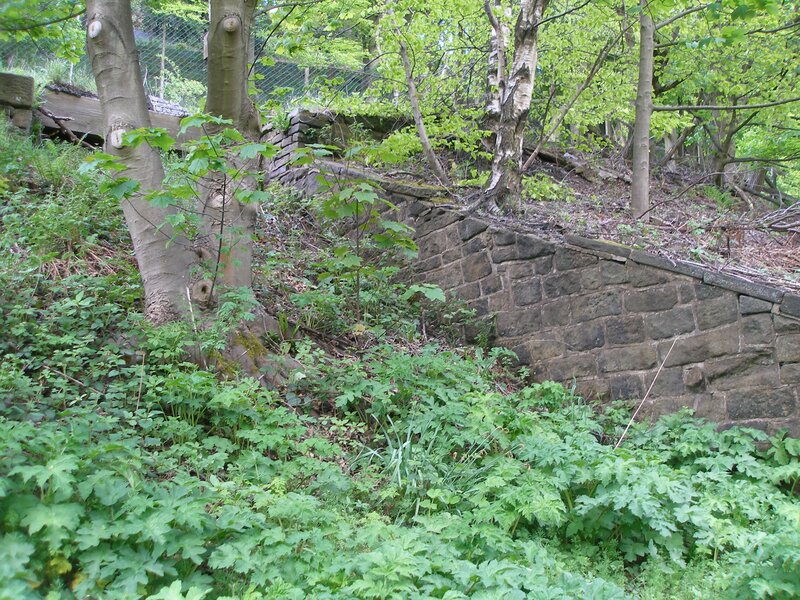 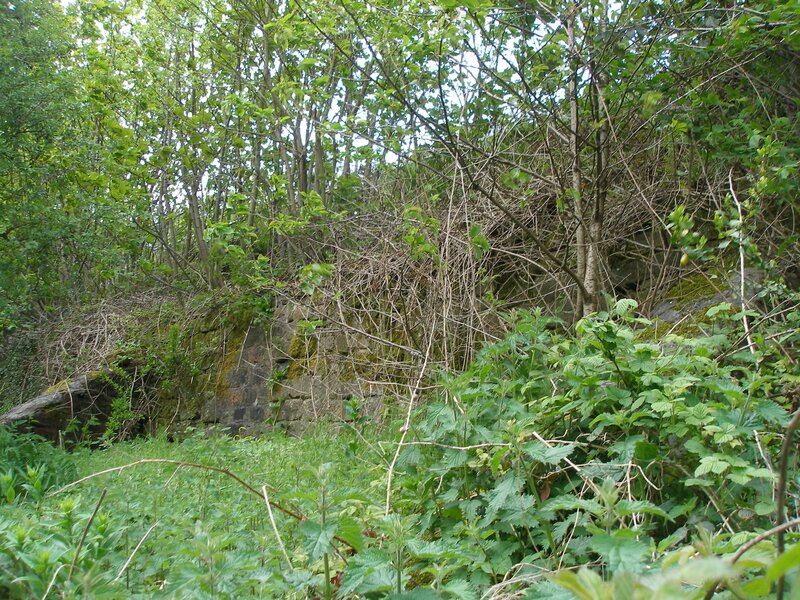 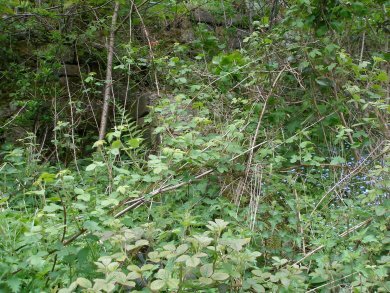 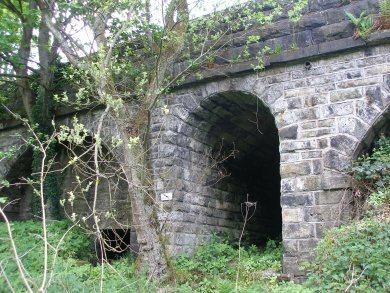 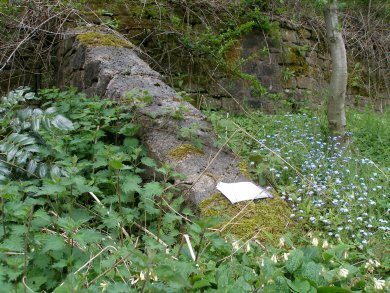 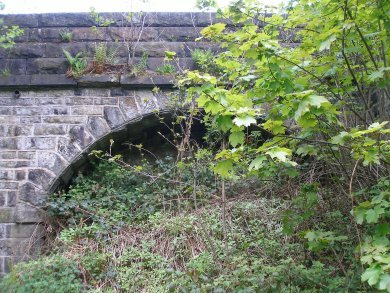 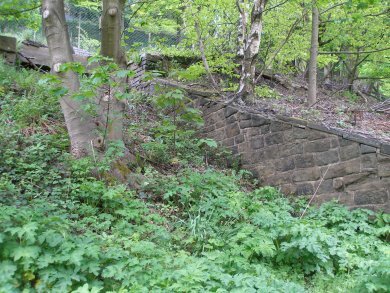 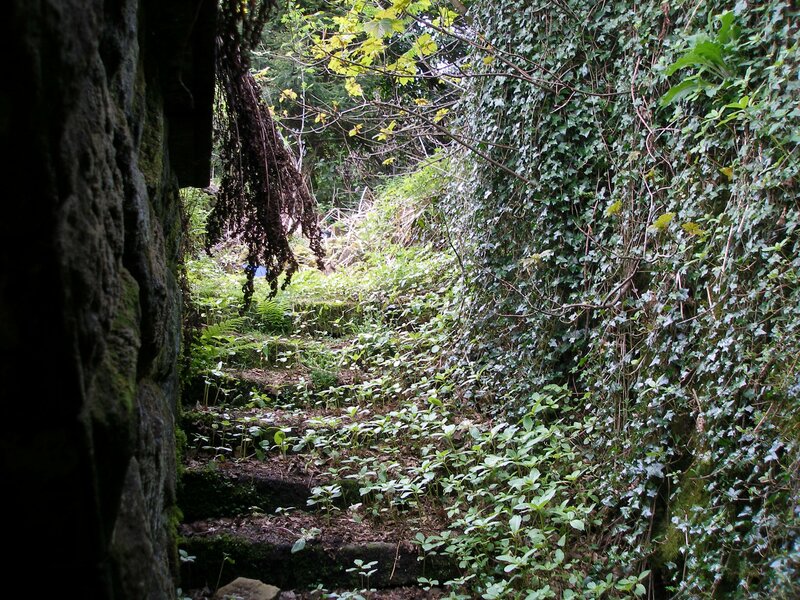 The second arch is an occupation bridge for a footpath which originally serviced the western end of Cockden Mill that stood above the railway at this point, and also led to steps up to Higher Eastwood. 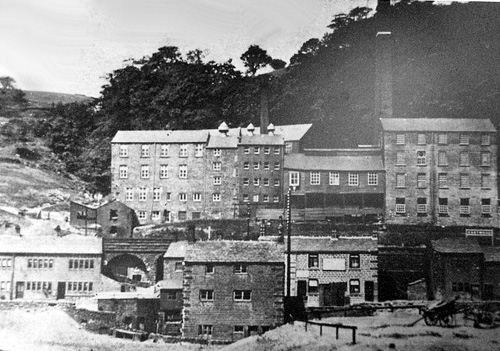 Click here to see the site in 1912 when the mill was fully functioning. 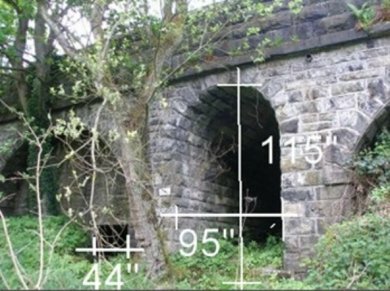 The three 'arches' are in the centre of the 1912 photograph, and the original Down platform started immediately after the 'third' arch. 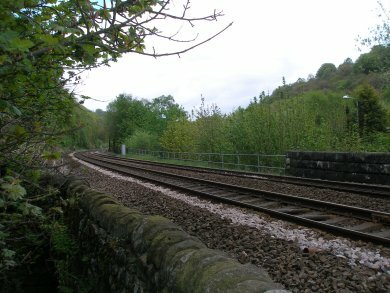 'recent' view. 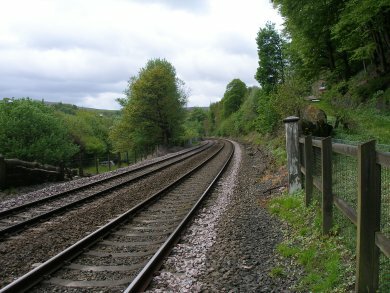 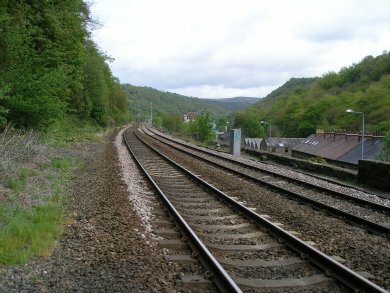 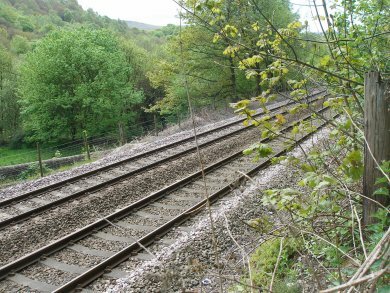 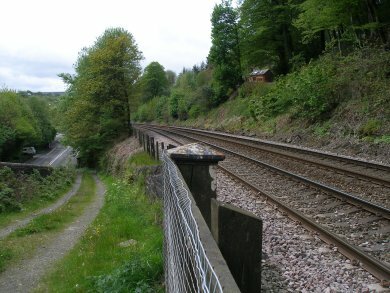 which lead up to track level and are parallel to the railway. 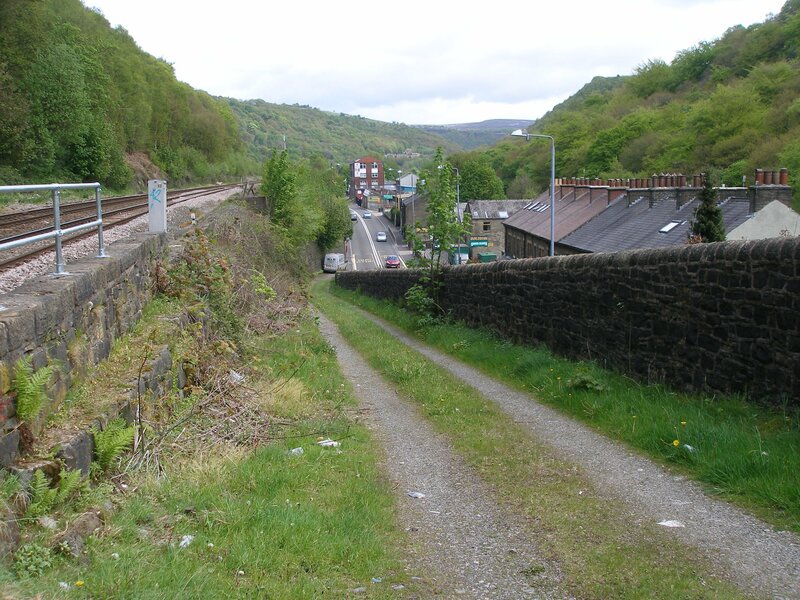 Looking away from the road.... and looking back towards the road. 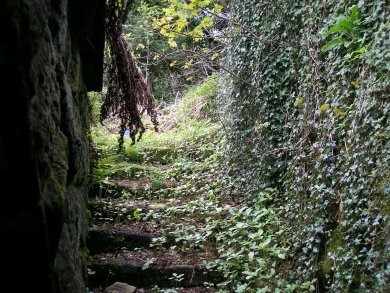 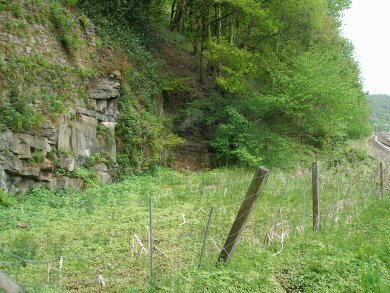 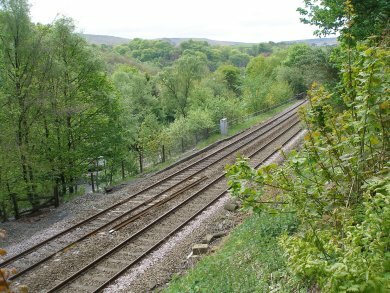 view is looking away from the railway with the steps leading to the right. The third arch in the sequence is 'blind'. 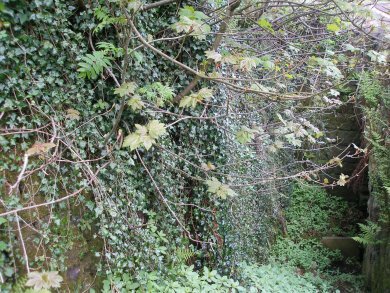 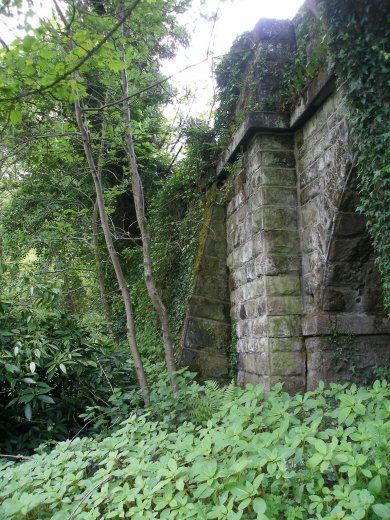 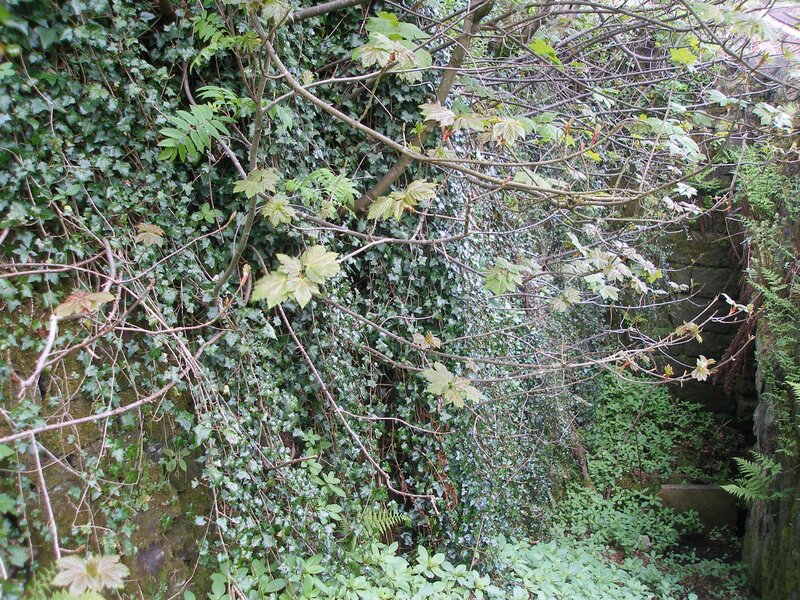 The coal drops 'proper' are currently covered in verdant greenery. 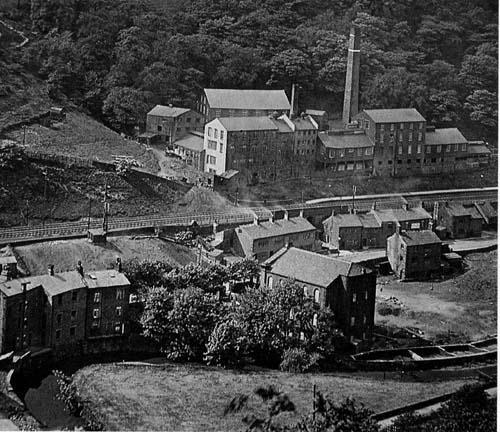 Examination of old photos shows that the areas covered green and yellow on the above map were two rows of terraced houses, and were demolished around 1960. 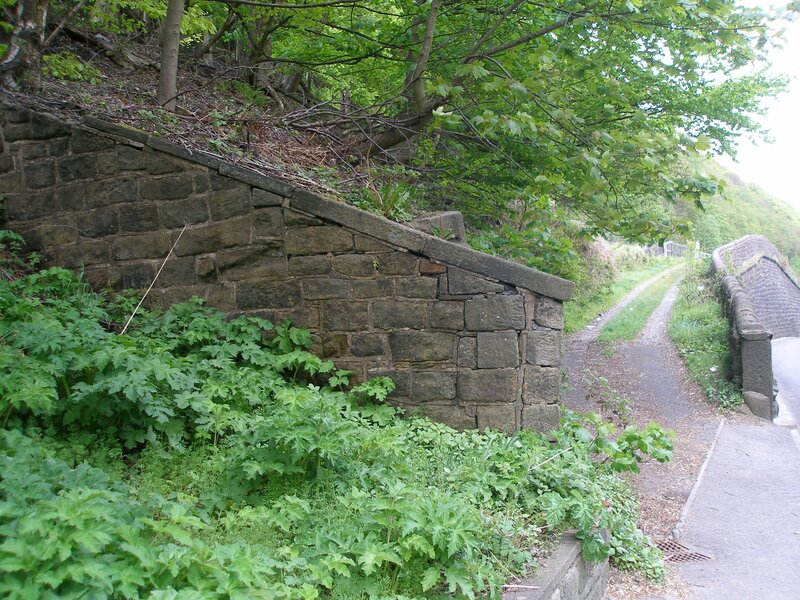 The modern bus lay-by now occupies the site of these two rows. 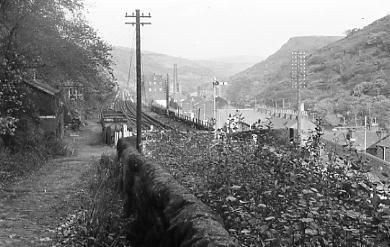 Click here for a reminder of how this area looked back in the late 1950s. 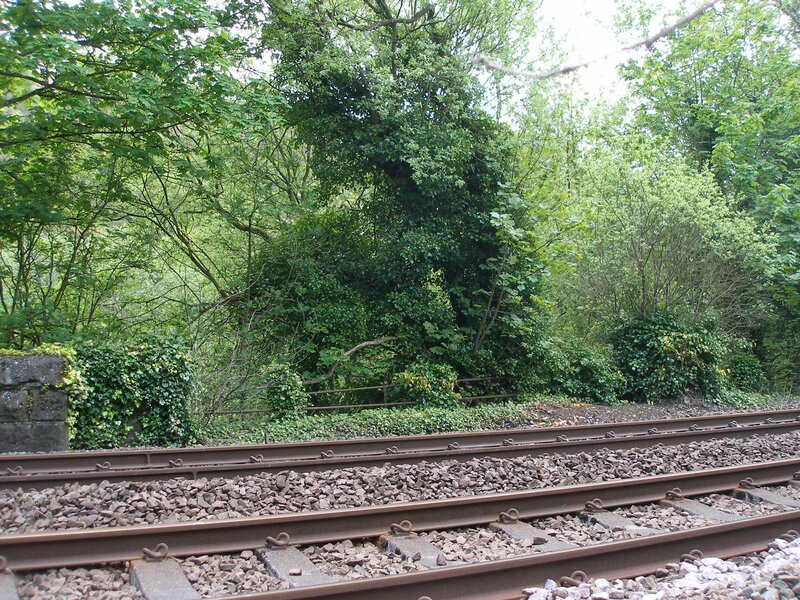 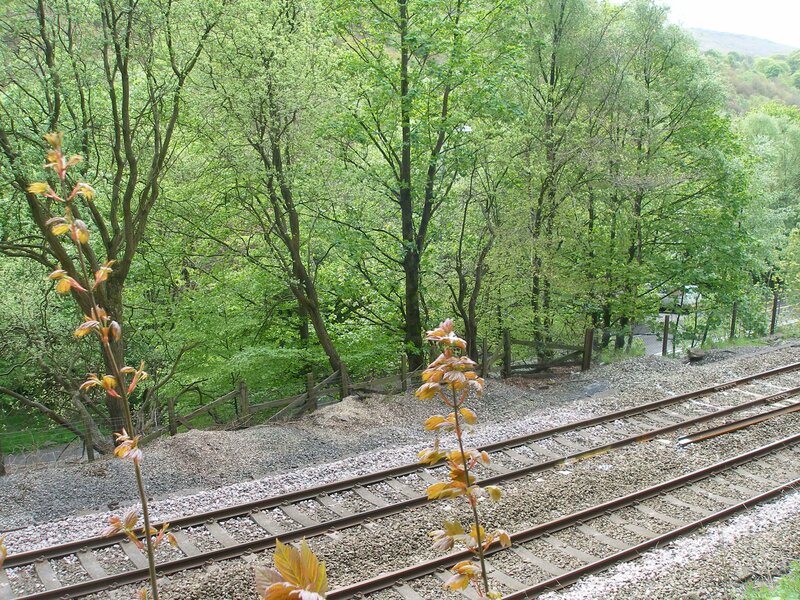 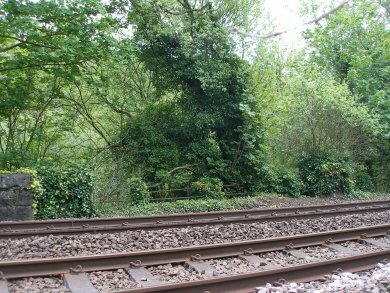 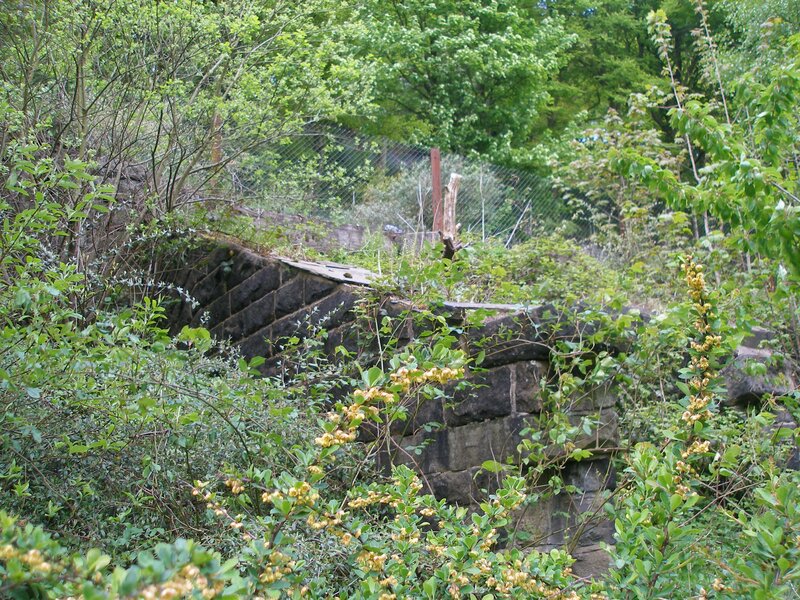 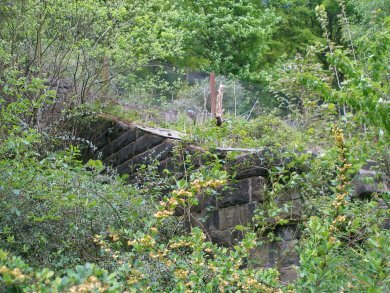 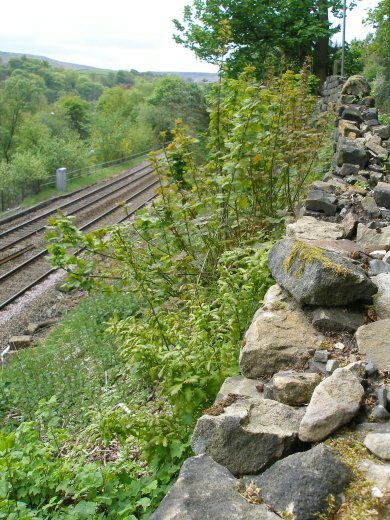 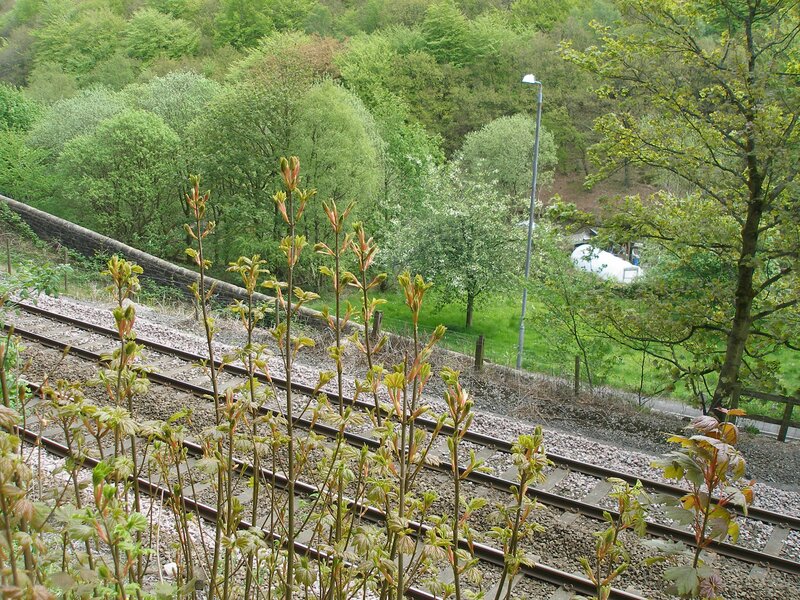 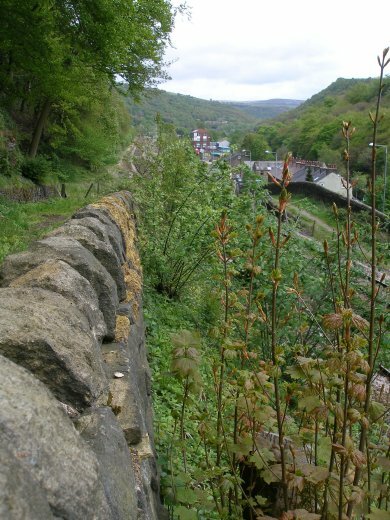 It is possible to use the track up from the old station site to view the coal drop area from above the railway. 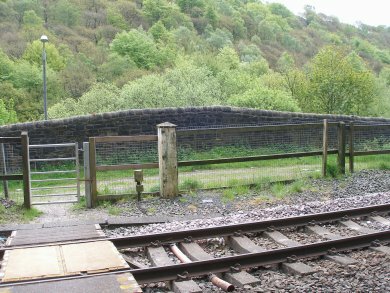 Click here for the same view dating from the 1960s. Click here for the comparative historical view. 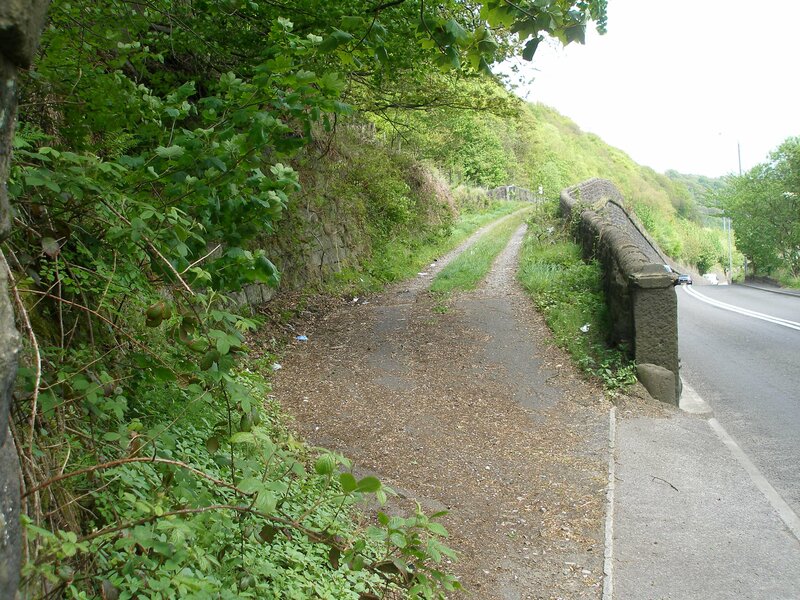 Click here to see how this area looked back in the 1960s.